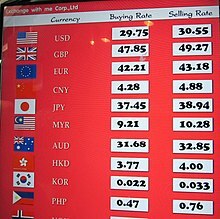 ^ "Currency Code Services – ISO 4217 Maintenance Agency". Retrieved 2013-03-25. ^ "ISO 4217 AMENDMENT NUMBER 165" (PDF). Archived from the original (PDF) on 2017-12-15. ^ a b c d "ISO 4217 AMENDMENT NUMBER 168" (PDF). 2018-08-02. Retrieved 2018-08-23. ^ "ISO 4217 AMENDMENT NUMBER 164" (PDF). Archived from the original (PDF) on 2017-12-15. ^ "ISO 4217 AMENDMENT NUMBER 169" (PDF). 2018-08-17. Retrieved 2018-08-23. Country codes are short alphabetic or numeric geographical codes (geocodes) developed to represent countries and dependent areas, for use in data processing and communications. Several different systems have been developed to do this. The term country code frequently refers to international dialing codes, the E.164 country calling codes. The ouguiya, also spelled "ougiya", is the currency of Mauritania. Each ouguiya constitutes five khoums. As such it is one of two circulating currencies, along with the Malagasy ariary, whose division units are not based on a power of ten. The Turkish lira is the currency of Turkey and the self-declared Turkish Republic of Northern Cyprus.